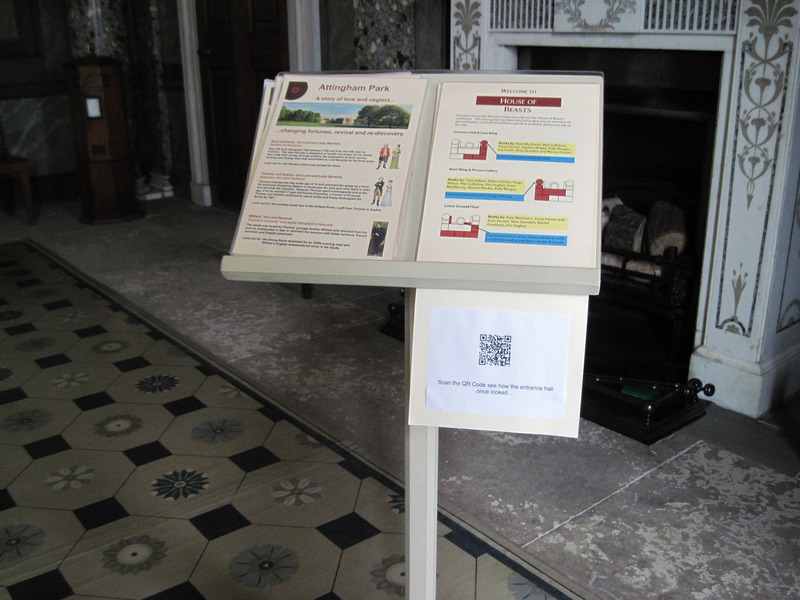 As a dissertation project for my MA in Archaeology for Screen Media at University of Bristol, I worked with Attingham Park, National Trust property in Shropshire, to incorporate QR code technology into their existing interpretation. Our goal was to explore how QR codes could fit into an established heritage institution such as the National Trust, as well as whether visitors would be willing and interested in using QR codes during their visit to the property. For the project I created ten short, 30 second YouTube videos and one Flickr album and linked them to the site using QR codes containing their web urls. The videos were short so visitors would continue to enjoy the actual property and the indoor videos were silent so as not to disrupt the other visitors. Additionally, visitors were invited to give feedback about the project by commenting on the YouTube videos or the Attingham Facebook page. We found that because not everyone has a smartphone, QR codes work best for extra information, but should not be relied on as a main source of interpretation. 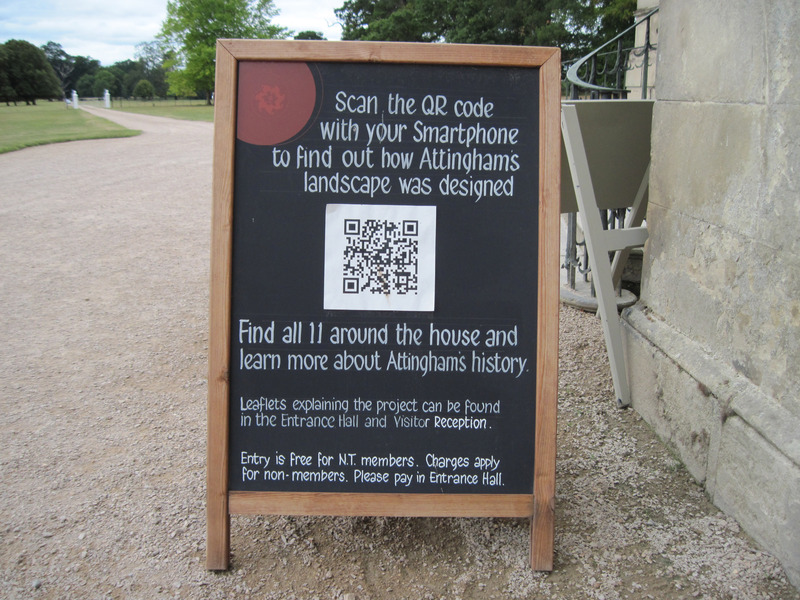 Rather than construct any complete picture of Attingham’s history, the Attingham QR code project is intended to add an extra level of engagement with the property for those who are capable of, and choose to, use it. 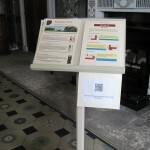 The project was launched on August 9th 2011 and so far we have had nothing but positive responses from visitors despite the mobile reception being quite bad at Attingham. I spoke to many visitors during the first week of the project who were really excited to be given the opportunity to use their smartphones in a heritage setting, or had always been curious about what these ‘funny’ barcodes were and were interested to learn about them. For those who did not have smartphones we provided the web address for the YouTube channel on the project leaflets, and since most of the films are silent, the codes are easy for other visitors to ignore and do not distract from their experience. 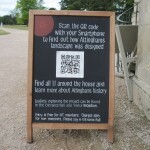 The National Trust employees at Attingham had heard of QR code use in other museums and were very excited to be implementing such a progressive interpretive technology into their property. Overall the project has been a great success and will remain up and running at Attingham indefinitely. Many museum traditionalists may ask why anyone would choose to encourage visitors to use their mobile phones in a museum setting when phones can so easily distract from the learning experience. I think it has become increasingly important that museums and heritage institutions embrace alternative forms of media in how they communicate information to the public. Smartphone technologies have drastically changed the ways in which we as a society, gain information. According to a recent Ofcom survey, a third of adults in the UK are smartphone users and its safe to say this number is going to increase in the next few years. The introduction of smartphones has meant that people can now gain information from anywhere at anytime, creating a shift in how our present society gains all types of information, including information about the past. Why not invite visitors to use smartphones in museums when smartphones have become such a huge part of our present-day lives. As audiences change, so must the ways in which museums and heritage institutions present their information in order to be understood. A balance must be found between new media methods of communication and old, in order to serve the greatest number of visitors with a valuable experience. After all, kids and teenagers love this sort of stuff, and aren’t they the most difficult audience to reach? It can also be argued that modern technologies like QR codes will distract from representations of the past and ruin visitor experience. However, why should visitors be asked to ‘imagine away’ the 21st century in order to understand some idea of the past which has been constructed for them? The truth is that all of our ideas about the past are shaped by our present-day views and ideas. It is impossible to forget the 21st century because we live in it! Museums and heritage sites should be embracing how the 21st century is altering our perceptions of the past because it often means we are learning more about the past. QR codes offer visitors a modern method of gaining information about the past by using a device they are already intimately familiar with, their own mobile phones. Visitors can choose which objects or places they would like to learn more about, which personalizes their experience and allows them to situate themselves within the learning process as active participants. Possibly most importantly, people love their smartphones and enjoy any excuse to play with them! Ask anyone who has one and they’ll tell you they are addicted. Why not encourage this addiction toward positive uses like education? Despite the problems this project encountered with mobile reception, we have come to the conclusion that Attingham’s model of QR code use as heritage interpretation works! Visitors are interested, willing, and excited to engage with history presented in this way, and for those who aren’t or don’t have smartphones, the codes are easy enough to ignore. On top of that QR codes are free to create and cost next to nothing to implement. I’m not saying we should do away with traditional forms of museum communication. I simply believe museums and heritage institutions should be providing visitors with the greatest number of options for learning and engaging with the past since everyone learns differently. True QR codes may be a bit of a fad and the technology may not last, but for the time being its free and easy to implement so why not use it while its hot? Especially if QR codes are getting people excited about learning, isn’t that what museums are all about?